TableHoppingNY is a website designed to bring local restaurants/businesses and New Yorkers together to know what each neighborhood has to offer. 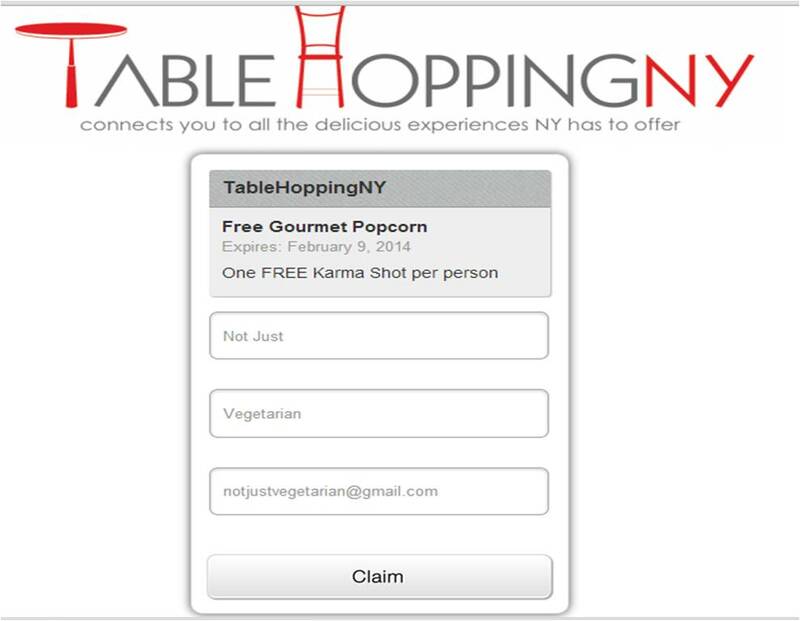 TableHoppingNY is giving away one free Small popcorn of any flavor at Pop Karma in the Lower East Side, NYC. Pop Karma serves pop corn made with natural, organic, and local ingredients in many flavors – Classic Mediterranean (Vegan), Zen Cheddar (Vegetarian), Pure Caramel (Vegetarian), Salt & Vinegar (Vegetarian), Kyoto Mix (Vegan) and Porcini Cheddar (Vegetarian) are current flavors. See Pop Karma’s website for details on past flavors, same day delivery in NYC, and for shipping in the US. Click here to redeem your coupon! You will be lead to a screen like the first one below. 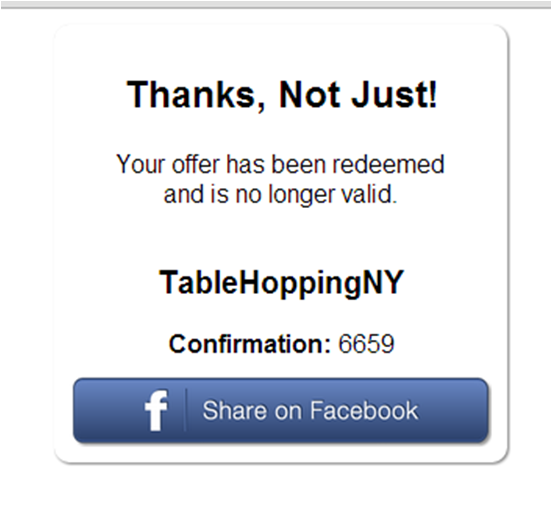 You will be sent an email from TableHoppingNY with a link to redeem your offer. When you click the link, you will get a unique code to redeem your coupon (see second picture below) – make sure you click the link only in the store (95 Orchard Street, New York, NY 10002) ….. This Giveaway is valid every day during store hours from 11 AM to 8 PM EST until Feb 9, 2014. NYC readers, please try Pop Karma and share your comments here…. Which one did you try? How was it? Did you try any other flavors?